In small breaks throughout my Sunday, I’ll usually take some time to plan out my eats for the week, make a grocery list, shop, and prep whatever I can in advance. I’ll take 10 minutes here or there to make some amazeballs or steam some eggs, but last night, I decided to see how much I could accomplish in an hour. 2. Get the quinoa in the rice cooker. 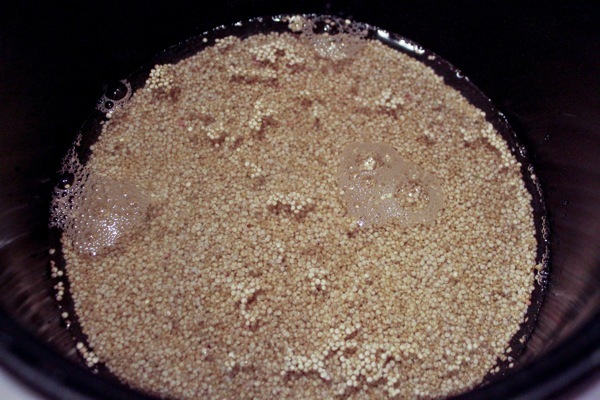 I washed 1.5 cups of quinoa and added it to the rice cooker with 3 C of water, and pressed the “brown rice” setting. While I haven’t tried it yet, the loaf came out beautifully. I had originally planned on making this bread, but when I figured in the time it would take to grind my own cashew butter, that option was out. This ended up woking perfectly, because there was 34 minutes left on the timer, and the bread needed to cook for 30. 30 minutes of bread baking + 4 for cleanup! I made sure to clean as I went along, too. 4. Steam the eggs. I cheated for this one and used the electric steamer- easy peasy. 5. Wash and chop the veggies. Bell peppers and cucumbers are my favorite veggie salad toppings, and I’d been skimping on them lately. No more! 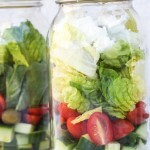 I can just open the fridge and quickly grab a handful to add to salads and wraps. 6. I used the same cutting board to chop the chicken, since I had already packed the veggies away (timesaver! Don’t do the reverse of this; a one-way ticket to salmonella city). 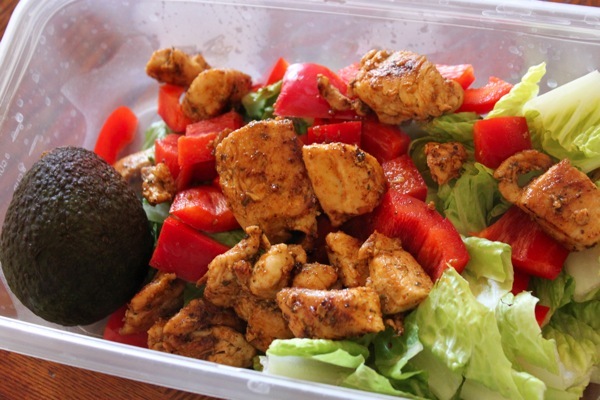 A few people have asked about the spicy marinated chicken I’ve been enjoying with salads lately. 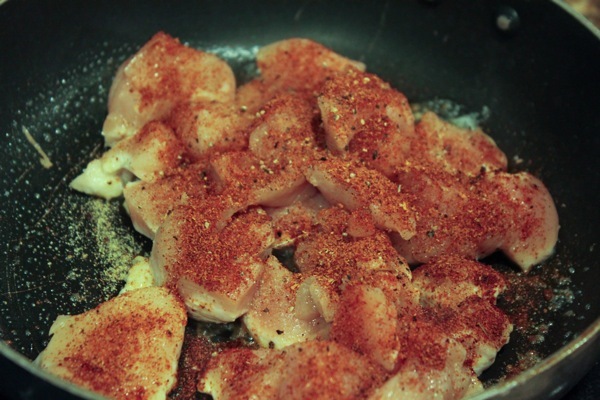 Just heat the pan on medium high, add some butter, the chicken, and cover it in rub + some salt, pepper and garlic powder. It comes out amazingly tender, glorious atop fresh salads or scrambled into eggs; I’m also going to try the combo with tempeh later this week. 7. While the chicken was browning, I made a batch of PB&J amazeballs in the small food processor. They were quickly finished and rolled into balls before I had to flip the chicken. So there ya go- a quick and dirty prep session to start the week off niiiiiiice and clean! I told the Pilot that I was making everything for a blog post just to see how much I could accomplish in an hour, but will definitely make it a regular thing. 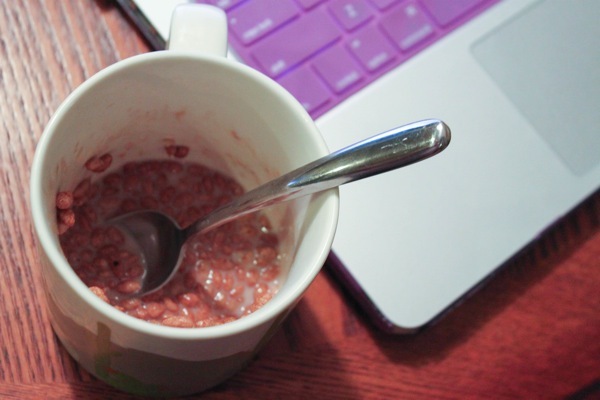 It will be so much easier to grab and enjoy, instead of taking extra time to make food/snacks and pack it up. Hope this is helpful for any of you who’d like to start prepping in advance- just adjust the ingredient amounts to suit your family. It’s so much easier to make healthy choices when you’ve set yourself up for success! 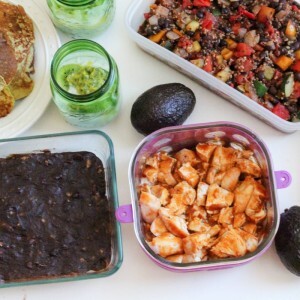 Love seeing different takes on food prep! I got a lot done last night too. Going to a work conference all week so got some mexican stuffed peppers, cranberry spinach turkey burgers, and protein pancakes all made! And packed up ThinkThin bars and cut up veggies with hummus! I love the idea of meal prepping! Everyone who does it seems to love it. Now I just need to put it into practice! I love prepping on Sunday. This weeks was done in two batches-some Saturday and some Sunday this week. I made trail mix on Saturday while a birthday cake was baking and then yesterday prepped some veggies and lunch stuff for all of us while cooking up the ground turkey and veggies for the chili that in the crockpot while I am working. It was actually a fairly easy week as far as prep goes in our house. How long do your yams stay fresh? Do you freeze them or just keep them in fridge. I love getting a view of others food prep! Pretty impressed. I’m not the best at it, but I’m slowly trying to get better at it. Everyone seems to really love it, so I’ve just got to try it out for myself. 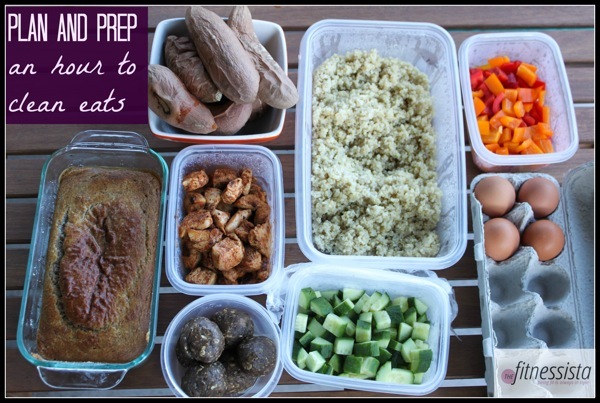 I also love seeing “food prep” posts and am addicted to the posts that follow using the components. Weird, I know. I would like to hear a review of the bread recipe. The one paleo bread I have made was so dense and heavy and eggy it was just not that good. This one sounds like it has possibilities because of the whipped egg whites. I’ve tried that bread. It’s good, but very VERY eggy, as you might assume, since it calls for like 6 eggs, ha! 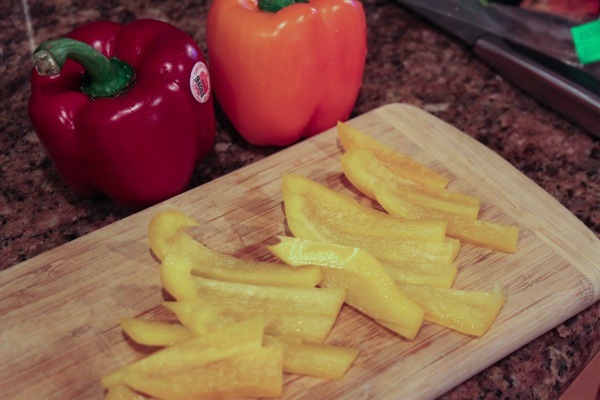 Do you find that your cucumbers or peppers get slimy when you pre-chop? Yum! What a great round-up. Love doing this kind of prep in advance. I love the hour of prep idea!! I always wondered how you had time to have such great lunches!! I am definitely a believer in meal prepping! Sometimes I prep lots and other times just a few things, but I find even just washing some lettuce and veggies and making a dressing can help out a ton. 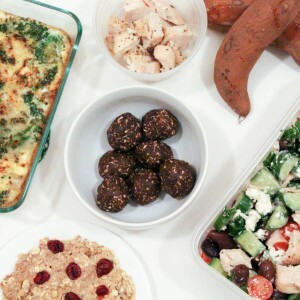 I love all the foods you prepped and actually prepped many of the same foods. 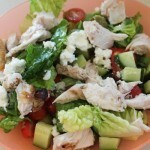 Yesterday I took 45 minutes to prep lettuce, dressing, qunioa and a thai peanut butter chicken salad. I have made the Against All Grains bread using Almond Butter in place of the cashew butter and it worked beautifully, we all loved the bread at my house! (including an 11 year old). The bread comes out a bit more dark than the one on the blog post, but delicious nonetheless, I really enjoyed it. 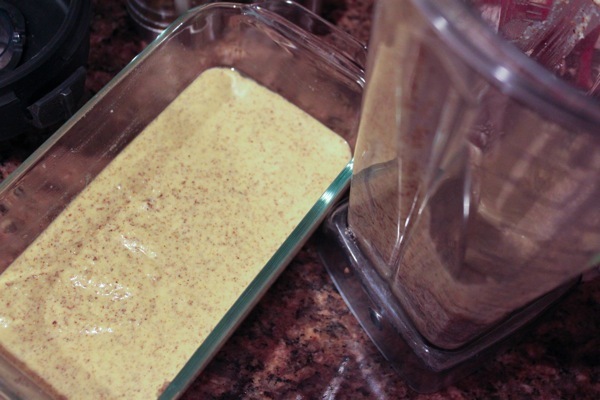 I know you are like me and love almond butter, so maybe give it a try! All that food in under an hour?!? Impressive! Love this! It’s really amazing how much you can get done in just an hour when you plan and think ahead. Awesome to be all prepped and ready for the week! 🙁 I am off tomorrow so I will prob prep a few things. Im glad I even had time to make it to the grocery! I love reading your posts on how you prep everything. I struggle with planning out my meals and prepping my lunches. By mid week I find myself super short on time in the evenings to get everything done and end up buying my lunches instead of making healthy ones the night before. Thanks for sharing how you throw it together so nicely. I have to make myself do this every week! I did this yesterday afternoon, too! It took me a little longer than an hour though so props to you! Love this! 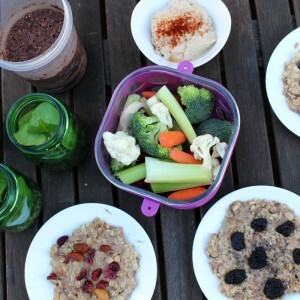 It seems like so many people say they don’t have the time to eat healthy (it’s a common excuse I hear from clients anyway), and you just proved that in just one hour you have a ton of healthy, real food to grab-and-go throughout the week! This is great to see! 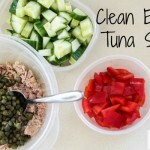 I would love to see more of your Sunday prep days! Ques re the cucumbers and peppers. Do you wash them before chopping? This is fantastic! I’ve been on spring break so I didn’t meal prep this week, because I have more time to cook during the day and wanted to play around. But I will have to try being as productive as this on future Sundays! I normally meal prep, but probably not as productively. Tiny request: Could you possibly link the updated Amazeballs flavors in your “Food” page sometime? I noticed it seems a little outdated, I was looking for the PBJ amazeballs earlier and couldn’t figure out where to find them without having to thumb through a lot of old posts looking for a link. Obviously today you linked them, but for future reference. Love posts like these, great for inspiration to get organized and planned for the week! And thanks for making it vegetarian friendly too – so many of these types of posts base everything around the meat, which makes it tough for us veggies to adapt it :). I’ve been wanting to try Elana’s bread recipe for ages, do you like? I have a love/hate relationship with food prep, but since I leave the house at 7:45AM and don’t get home until 8:15-8:30pm every night, I have no choice! Once I finish chopping and packaging and cooking, though, I am SO happy! I try to do my beast salad and chicken prep on Sunday as well. My life is so busy that I have shorted my routine and have now started buying the pre cut fajita vegi’s at F&E. They dont come with any sauce or seasoning, just are pre cut and ready to throw in. Its perfect, they contain all the vegi’s that I would add anyways…green/red peppers, onions, and sometimes I get the one with pineapple too. And with my chicken, I have been throwing it in the slow cooker, and it is perfect and tender and easy to shred for all kinds of use. 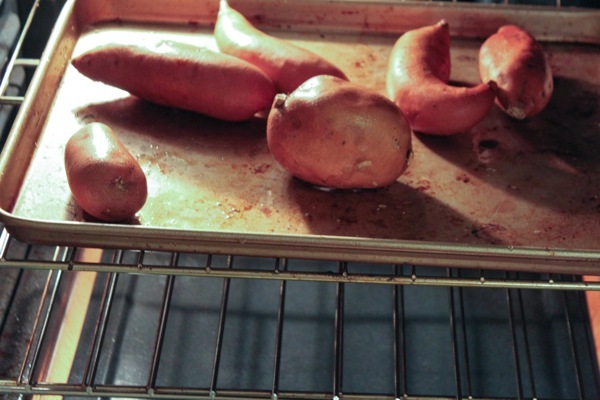 Do you eat the baked sweet potatoes cold or reheat them? 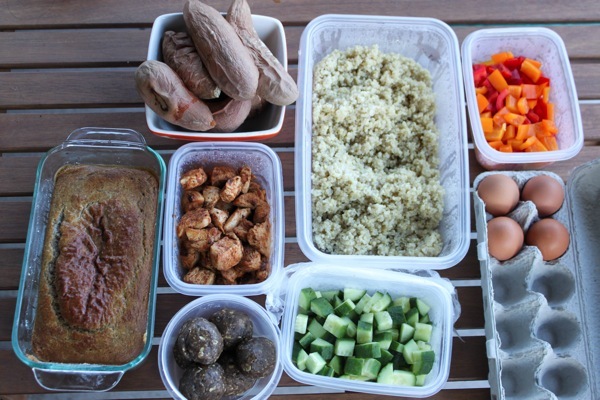 That’s an impressive amount of food prep for just one hour! I don’t really do meal prepping, but I make a few recipes that make leftovers throughout the week, which is a big help. I can just imagine you doing all that in an hour – BEAST MODE! That’s an awesome amount of yummies in 1 hour :]. Must have been really enjoyable, I love working efficiently in the kitchen, especially when the food is delicious. This is such a great post! Thanks to you, I was inspired to do a little prep of my own: made your slow cooker chicken cacciatore for the week, chopped cucumbers, washed lentils and put in fridge, and have protein pancake batter in the fridge waiting to be cooked up in the morning! I’m really trying to be intentional and clean about my eats after a spring break that totally threw me off the wagon, so this was great! I LOVE meal prep. I spend 1-2 hours on a sunday and then probably another 45 minutes Wednesday/Thursday and I am set to grab and go with meals all week long. I know it is repetitive and people may groan at it, but fail to prepare, plan to fail! Meal prep has been integral in my training as well as weight loss/maintenance. Thanks for posting some new ideas to try out as well! LOVE this post!!! An hour isn’t too much to ask for to have sweet eats for the week!! I JUST made your Cashew Butter & Jelly ballz.. OMG.. they never made it into “ballz” unfortunately. Just ate em with a spoon out of the processor. They were delicious. I will definitely be using them as a go-to post workout snack from now on. Thanks! Really liked this post! With a 6 week old baby I have to maximize my time in the kitchen. I have a steamer but no clue other than brown rice, thx for that tip. 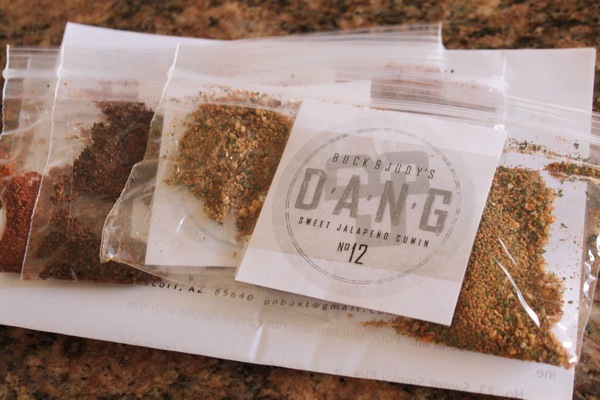 Where do you get this rub from?? I was trying to google “buck and Judy’s” but nothing is coming up. Is there a website to order the run from or can you buy it in stores?? Thanks so much!! 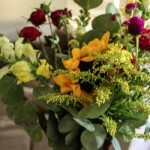 a friend is making it- i think they’re going to set up an online store. i’ll spread the word when they do! This post was really helpful! I love following your blog, and recently started one of my own to track my three months of travel to 10 different cities. My husband and I are trying to maintain clean eating as much as possible while are are on the road, and I tagged your blog in a recent blog post to highlight a glorious salad beast (a term I learned from your blog 😉 ) that I enjoyed while in London at their amazing three-floor Whole Foods! Always great to get your ideas and inspiration Gina! I’m new to food prep and clean eating. I know this might seem like a dumb question but if you’re prepping for the whole week, how do you keep the cooked meat fresh? Such an inspiration!!! THANK YOU! !